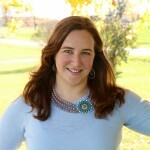 HARRISBURG, Pa. — “When you talk about the Pennsylvania Farm Show, there are two things people really love — the animals and the food,” said Nell Abom, public relations representative for several Pennsylvania Farm Show vendors. With the 100th anniversary of the Pennsylvania Farm Show this year, the PA Preferred Food Court introduced new items like fish nachos, mushroom burgers and even chocolate covered bacon. 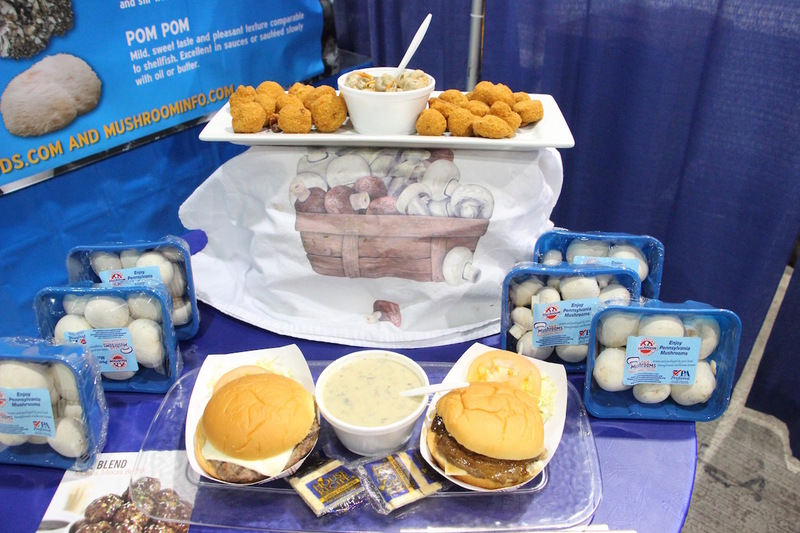 At this year’s Pennsylvania Farm Show, Pennsylvania Mushroom Growers brought back old favorites like the breaded mushrooms, marinated mushroom salad, cream of mushroom soup and a grilled portobello sandwich, and introduced the blended mushroom burger. Highlighting old favorites, the breaded mushrooms returned to the Pennsylvania Mushroom Growers booth for the 38th year. Dale and Cyndy Dinsmore, of Franklin County, come every year to get their mushroom fix. “They are wonderful,” the Dinsmores agreed. “But I need just one more to be sure,” added Dale, as he sampled some of the breaded mushrooms. The Dinsmores always purchase a few extra to take back home. 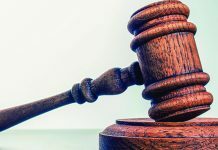 This year, a new mushroom blend burger was sold at the Farm Show and was a hit, according to Gail Ferranto, president of Buona Foods and representing Pennsylvania’s mushroom farmers. “The trend is to blend,” she said. The burger consists of 70 percent ground meat (in this case, red meat) and 30 percent mushrooms. The blend is a new cooking concept that can be used to incorporate mushrooms into any dish. Mushrooms are also high in B vitamins, antioxidants, selenium and potassium, explained Ferranto. “The burger is an American classic … so the burger is just something we had to offer at this year’s farm show,” said Ferranto. PennAg Industries gave a shout out to the fish industry by representing producers with two different options of fish nachos. Both served on a corn tortilla and bed of nacho chips, customers could choose from the herb crusted tilapia or the Pennsylvania trout. Both options were topped with fresh cabbage slaw, pickled onions and a lime crema. “The fish nachos are swimming out of the building,” joked Mindy Fleetwood, assistant vice president, PennAg Industries. PennAg also introduced a salty, sweet combination — chocolate covered bacon, which consisted of a thick slice of Hatfield bacon, dipped in milk chocolate and drizzled in white chocolate. Fleetwood said they had no idea how popular the bacon would be when they sold out more than 1,100 pieces during the first two days of the farm show. “But we were back in business by Monday morning,” she said. Another staple of the PennAg food both, pulled pork, returned with new barbecue sauce options. 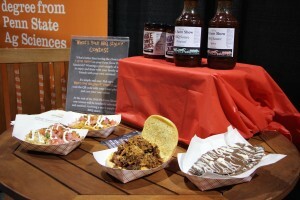 PennAg released a set of special Pennsylvania Farm Show barbecue sauces in spicy and original flavors. 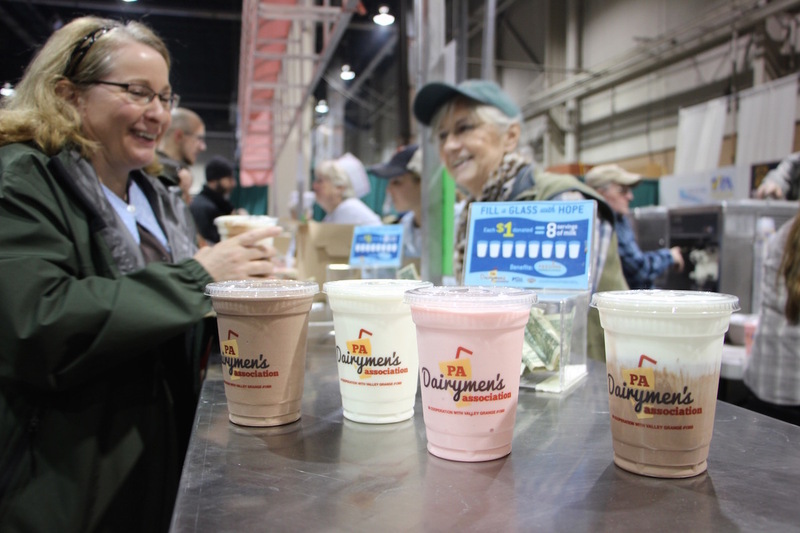 Many would find it difficult to walk out of the Farm Show without purchasing a milkshake from the Pennsylvania Dairymen’s Association. One of the highlights of the show was the unveiling of a new milkshake flavor in honor of the 100th anniversary of the Farm Show. The traditional chocolate and vanilla shakes were joined by strawberries and cream this year. “The milkshakes are our most popular product,” said Dave Smith, executive director of the Pennsylvania Dairymen’s Association. The dairymen’s booth is set up to serve around 500,000 people and uses approximately 18,000 gallons of milk during the nine-day show, said Smith. 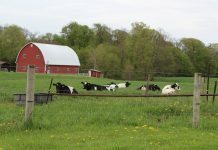 “To give you an idea of how much milk that is, the average dairy herd here in Pennsylvania is about 80 cows. If they are an average producing herd, it would take the herd 24 days to have enough milk for our milkshakes,” said Smith. Deep fried mozzarella cubes are also a popular product at the dairymen’s booth. They consist of four deep fried cheese cubes on a skewer. Smith said the booth will go through about three and a half tons of cheese during the week. The farmer-driven, association food booths link consumers back to the producers. “There is a disconnect from people and the farm,” said Abom. 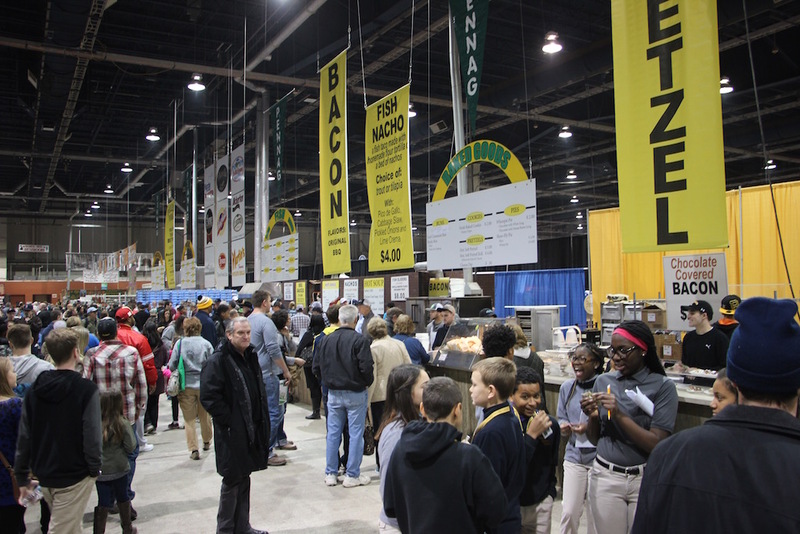 The Pennsylvania Farm Show is place where consumers can make direct connections between their food and the producers all under one roof. 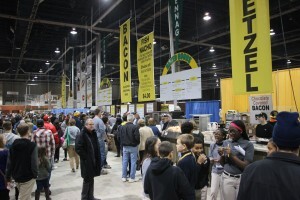 PA Preferred Food Court was a busy place throughout most of the PA Farm show. The Pennsylvania Mushroom Grower’s Cooperative sold more than 12,400 pounds of mushrooms. 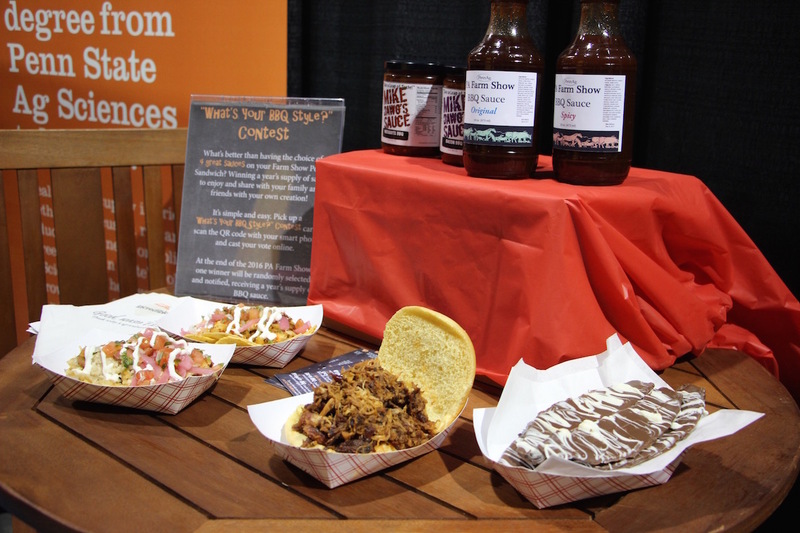 PennAg Industries sold more than 12,000 pounds of pulled pork, 7,000 pieces of chocolate covered bacon, 5,000 fish nachos and 105 gallons of PennAg Farm Show barbecue sauce. Pennsylvania Dairymen’s Association used more than 19,000 gallons of milk shake mix, 450 gallons of ice cream and 4.1 tons of mozzarella cheese.